This is a multi-sport oversized mail order issue that has subsets for Baseball, Basketball, Football, etc. The Basketball Champions subset is numbered in the upper right corner and the back has copyright information including the Packet it was distributed in. Starter sets included 17 Packets with 12 cards each. Subsequent packets arrived in the mail on a monthly basis as long as the collector continued to pay. If a player changed teams or stats were updated, the entire packet would get updated and the Packet numbering would change. MrMopar has some great info on the variations this created. 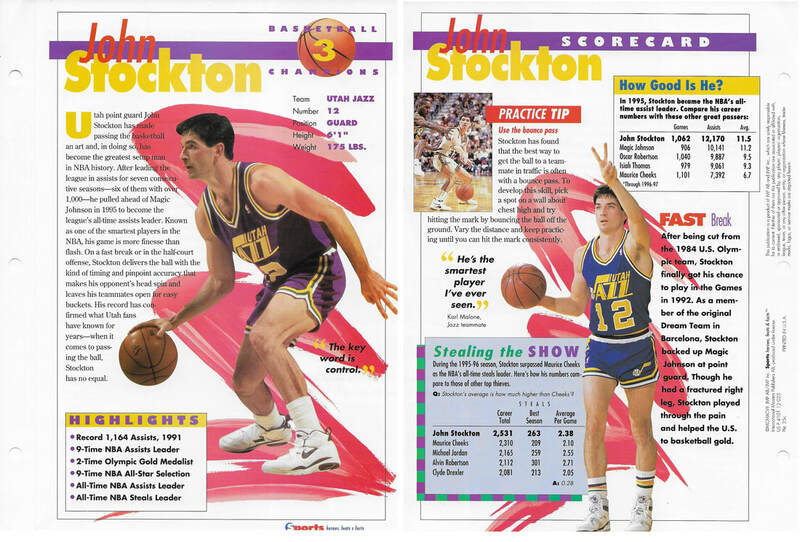 JAZZ STOCKTON,JOHN 1994 Sports Heroes Feats & Facts - Basketball Champions #003 Pkt.25c variation (Highlights: 9-Time NBA Assist Leader, 2-Time Olympic Gold Medalist, 9-Time NBA All-Star Selection) "
76ERS ERVING,JULIUS 1994 "Sports Heroes Feats & Facts - Basketball Champions #016 Pkt.04 variation (The ""Other"" League has a math question)"
76ERS ERVING,JULIUS 1994 "Sports Heroes Feats & Facts - Basketball Champions #016 Pkt.04e variation (The ""Other"" League does not have a math question)"
76ERS ERVING,JULIUS 1994 "Sports Heroes Feats & Facts - Basketball Champions #016 Pkt.04f variation (The ""Other"" League does not have a math question)"